Things are looking great so far, loved the update and can't wait to see more. Seriously looking forward to this. Thank you for including it. I like the conversation text style, more PST-like with textual description alongside the dialogue. Not necessarily in the typographic sense--I'll leave that to the font fiends--have y'all seen the documentary Helvetica? It's a real hoot. Available on Amazon Prime if you have it. And I like the surrounding old-school wood texture. At first I thought I wanted stone, like the old BG series, but wood is actually "warmer" and more inviting than stone, in a way. Hard to describe. NGUI only uses bitmap fonts, so we'll have to adjust the kerning and other errors by hand, but we're aware of it. One way or another, fonts should scale with resolution to some degree; after all you'll be supporting resolutions from 720p to 1440p at least. Edited by Zeckul, 20 August 2013 - 06:55 PM. And I like the surrounding old-school wood texture. At first I thought I wanted stone, like the old BG series, but wood is actually "warmer" and more inviting than stone, in a way. Hard to describe. Agreed. Although, I think I'd like to see more natural/grown type visuals and less synthetic-styled stuff. In general... not specifically in the dialogue UI. Think tree-trunk instead of carpentered table. Or, a combo could work, I suppose. I dunno. I know it's silly, but sometimes, the excessive amount of tool-crafted look/feel kinda makes the UI feel a lot more like it's intruding in the screen. Like it doesn't really belong, but someone installed it by hand. What does this mean in regards to the sate of the vertical slice? Do you be on to production before or after the VS is finished? Great job! Sounds like you've been very busy! Ignore the suggestion in yellow text if the scrollbar has an exact click-somewhere-on-the-scrolline-scroll in which case it wouldn't really serve a purpose. Stronghold sounds like it is off to a great start; I really like the idea of being able to send your companions on missions. My question is, will we be allowed to play through these missions as our companions (possibly leading a group of npc hirelings, or in tandem), or will the mission events be reported back to the PC? Edited by curryinahurry, 20 August 2013 - 07:35 PM. How tolerant this stronghold thing will be if I spend my time on exclusively adventuring? In Xcom: Enemy Unknown, I ignored base management and ended up with losing cities, which are not reversible-once lost they are gone forever. In fact, I made a typical mistake as an RPGamer in that game by completely ignoring resource management gameplay. Eventually, I managed to hold my hands on controlling resources enough to proceed the game but bit annoyed by the fact the game didn't allow me to play it in my own way: Simply piling up tactical successes and build characters were not enough to let me proceed the game. I know we are talking of different games, though. Edited by Wombat, 20 August 2013 - 08:05 PM. I like the conversation UI - I wonder though does it support NPC (speaker) portraits, as in when you speak to an NPC who has a portrait - where is their portrait placed ? Is it like the IE games where it goes next to their name? I'm not 100% sure about the light blue color of player responses. The IE games had red, and it was very clear from the get-go and a very distinct color. Does the IE red not look very good on your UI background? A sharper color might be a better idea, but it's a minor complaint overall. Does the conversation UI take up say "half" the vertical screen like it does in the IE games? If not where is it placed? The vertical slice is finished and has been for some time. We are in production right now. For what it's worth, red-on-black is a very bad idea. I realize the text may not be just-plain-red, and the background isn't exactly black, but... well, let's just say it's awfully close to a bad idea. Edited by Lephys, 20 August 2013 - 07:51 PM. Google is your friend if you can't remember. 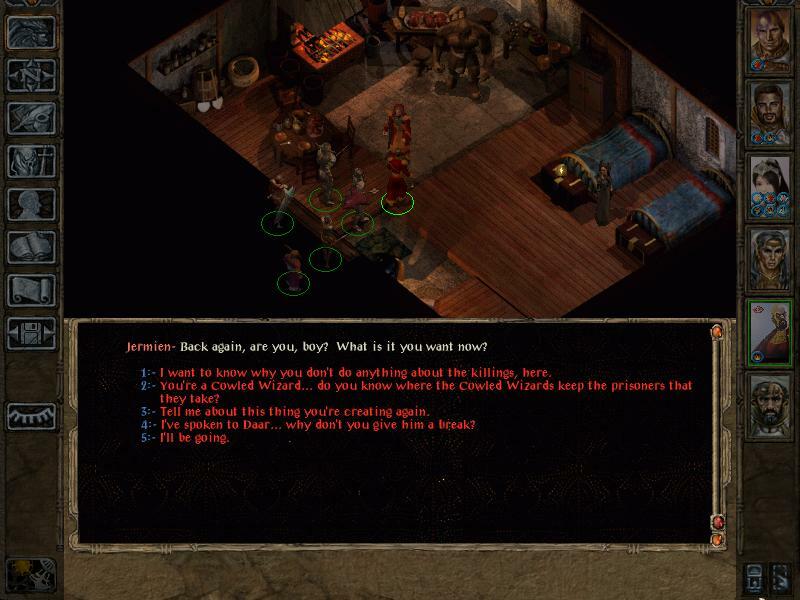 BG2 did have red on black and IMO it looked very good. No big deal though I guess. It's not that it looks bad or anything. Edited by Sensuki, 20 August 2013 - 07:59 PM. Great update. Super-informative as ususal. The conversation UI is absolutely gorgeous. Reminds me of how much I loved Icewind Dale's UI over all the Infinity Engine games and I'm profoundly happy you're revisiting it here. I'd agree with a previous suggestion about formatting description text differently. I love reading it and miss it in recent crpgs but it should definitely stand apart more than just dialogue printed without quotation marks. Italics, brackets and/or different colored text and then just drop the speech marks maybe? Also I would really like to see the portrait of the person you're actually talking to. Even if it's a generic one, It creates a connection with the conversation you don't get from the pixelated little person in-game and I find it helps me engage with the fiction of the conversation. Good point I guess. 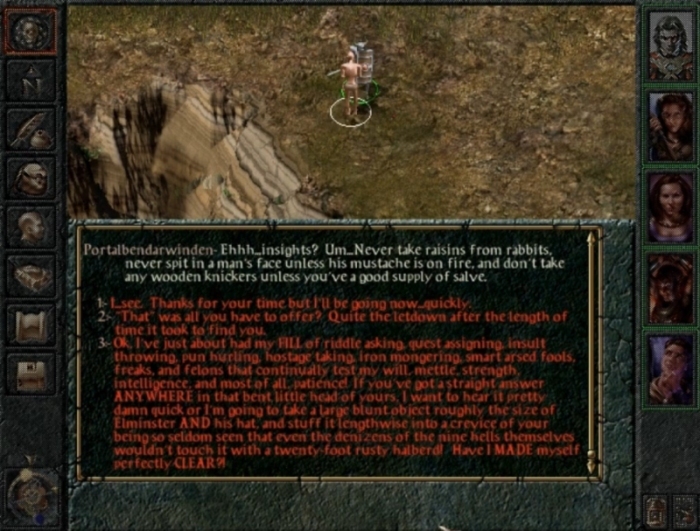 Although Icewind Dale 2 used repeat marble patterns in the convo UI, something that make the criss-cross pattern not stand out as a blatant copy/pasta would be good too, whether it be something as simple as swapping the grain of the wood on the tiles. Oh, but they explained what the vertical slice is in a past update…I admit I didn't know it had ended while back but, reading the title of this update was good enough indicator. In any case, I've gotten an impression that it would be more beneficial to both ends (designers and backers) to let the designers concentrate on what they are working on till they come up with something to show off, probably except that some of us have really good ideas. Red text is usually always a bad choice as it is notoriously difficulty to compress in both jpeg and video. Also, it could be an issue for people with color-blindness. The red text in IE games was pretty awful. Oh yeah, what about quests in those Defiance Bay areas that take you to areas that aren't created yet ? Do you have the first node ie. Quest giver implemented and then put a note somewhere to come back to it when the other areas are done?